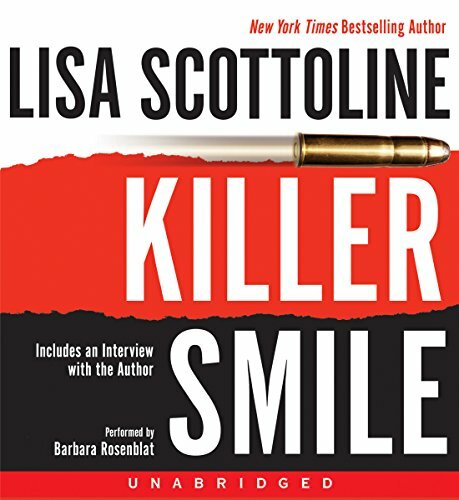 ©2004 Lisa Scottoline (P)2004 Recorded Books, Inc. and © 2004 HarperCollins Publishers, Inc. I have to defend my very favorite audio reader of all time, after reading the awful reviews of 'Killer Smile.' Perhaps the producer did fall down on the job here, but I would implore listeners to try Elizabeth Peters' Amelia Peabody series read by Rosenblat; I usually select my audible monthly choices from Rosenblat's performances. I think she has the most incredible facility with voices and accents I have ever heard...and as a performer myself, I am a great admirer of her craft! I've never read Scottoline before but I was impressed. The book was exciting and full of tidbits of humor. I plan to listen to it again now that I know the ending! Not her best, but good enough? Since the pickings have been slim, and I had been awaiting this book's release to Audible, I was very excited to download this title. I cannot say I was disappointed, but I also cannot say I was satisfied. I will say, however, that in hindsight, I would have waited & picked another title. I give this book a three-star rating. It doesn't hold a candle to Scottoline's previous work. The smacking and moist noises she makes ruined the book experience. Always love Lisa's books just wished it was a different narrator. Mary DiNunzio has hit a dead end on a case she's working on involving an Italian American sent to an internment camp during World War II. It's a pro bono case, and everyone involved is either dead or failing. So why is the previous lawyer on the case dead? And why is she being followed, robbed, and scared? Soon Mary realizes that someone is quite serious about making the past stay buried, along with the truth. Barbara Rosenblat reads this with real character, and the pacing is excellent. The history of how Italian Americans were treated during World War II in the United States also comes to life, and Mary's character continues to grow and remains a favorite of mine. A fun romp wrapped into an exciting mystery. I've always been a fan of Scottoline's fiction and this new book was as good as the rest, perhaps better since it was unabridged, unlike earlier works previously available on Audible (hey, Audible, where DID they go??). The fast-paced plot kept me interested and there were plenty of humorous touches to provide comic relief. Unlike another reviewer, I thought the narrator was nearly perfect at capturing the personality quirks of the heroine, Mary D'Nunzio. Speaking of eccentricity, there WERE a few times when the stunts Mary pulled required me to suspend my disbelief--surely no real attorney would think to do some of the things she does to solve her case. But the book was so much fun, these qualms passed rapidly as I got plunged into yet another disaster-in-the making. I'm looking forward to more Rosato and Associates novels in the future. I have enjoyed Rosenblat's narration of other Scottoline books, but either she was chewing gum or crinkling cellophane while reading this one! I suspect it is the producer who fell down on the job, but in any case, this is not an audio I would ever recommend! After listening to this audio book for a few hours, I'd wished I hadn't opted for the better quality audio format. The narrator made various annoying noises with her mouth throughout the read. Between her heavy breathing and her smacking I couldn't concentrate on the piece. She just wasn't a good pick for this piece. First, I should say I haven't read the book. I should have listened to the sample! The narrator has a dry mouth and moistens it frequently while reading. It's very distracting. I only listed 10 minutes. I usually like her books and don't mind the narrator but I couldn't finish it! I can't stand when you can hear the narrator swallow and breathe. It was horrible!